Up for sale we have a 1969 Chevy Camaro SS. This car is a factory X11 car that has undergone a beautiful restoration. Easily one of the most Iconic muscle cars ever built, this '69 adds to the desire having had multiple upgrades done. It has a phenomenal body on it with excellent fit of the 2” Steel Cowl Hood and Deck Lid. Down the sides are straight and both doors have a good fit and gaps. Everything is covered in the Glacier Blue paint, which is the factory color for this Camaro. It has been redone in base coat clear coat and is accented by the White Hockey stripe that's buried under the clear. The paint has been buffed and polished to a deep rich shine that has a mirror finish. This '69 has Front and Rear Spoilers and both bumpers have been replaced. The rest of the chrome and stainless is all in excellent condition. To finish off the exterior it's sitting on a set of 18” and 20” Billet Specialty Wheels with New Tires. On the inside, it's done in the classic black that complements the exterior perfectly. This is a factory Bucket seat car and the all the seat covers appear to have been replaced and are in great condition. You'll notice it also has the center console with gauges, Four Speed shifter, and working console light. All the door panels and headliner are also done in black and appear to have been replaced. The headliner has an excellent fit and the dome light is working. Looking at the dash you'll see the in-dash tach and Speedometer are in great condition. This Camaro has a working factory style knobbed radio, and the column is tilt with a Rosewood Wheel. Inside the trunk is detailed very nice and it has the spare and jack. Under the hood it features a 383 engine that's set up with a Stealth Aluminum Intake, Dual Line Holley Carb and stock style breather. It's dressed in Aluminum Valve Covers and for exhaust it has Headers with Dual pipes and Flow Master Mufflers. 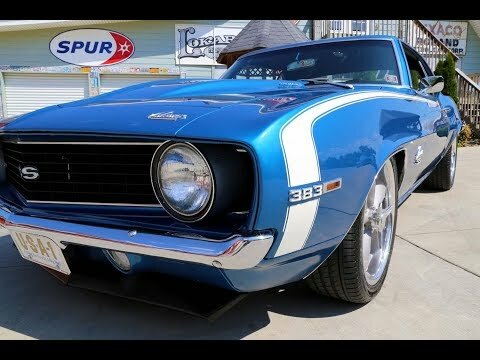 This Camaro also has Power Steering and Power Brakes with Disc on all four corners. Oh, and you can't forget that it has been upgraded to Vintage Air Condition. The 383 is mated to the Muncie Four Speed and 10 Bolt Rear. When you look under this '69 you'll see the frame is in excellent condition and has had connectors added. The floors are all in excellent condition as well with the rear passenger appearing to have been patched.